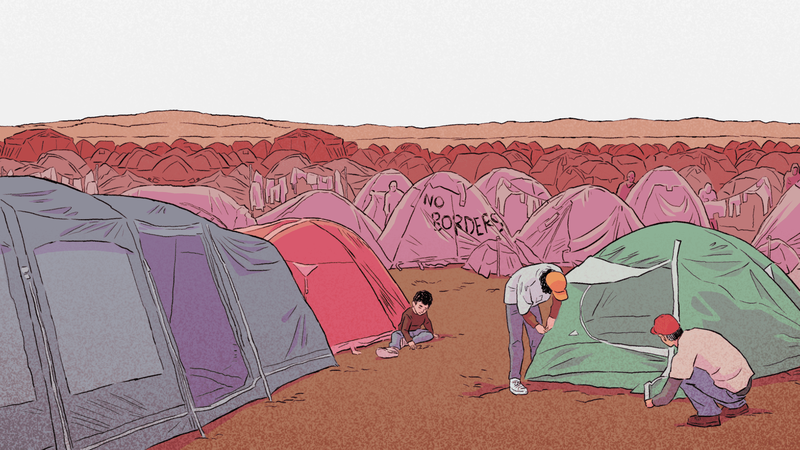 Bury me, my Love tells Nour’s story as she flees Syria and tries to reach Europe. But why did the young woman decide to leave? Find out and get a preview of Bury me, my Love by testing the story’s prologue, Nour’s Choice, for free. For best viewing experience, we recommend accessing this prologue from a smartphone. Bombs have been falling for years on Homs, Syria, tearing the city to pieces and spreading death. So when her younger sister is added to the list of casualties, Nour can’t take it anymore. She decides to leave for Europe, with hopes of a better life. Her husband, Majd, can’t come with her. He recently lost his father, too, but his mother and grandfather are still alive – if he goes, they won’t be able to make it without him. So together, Nour and Majd prepare her trip as well as possible. They study the maps, make a list of items she could use, gather their meager savings and buy two smartphones to keep in touch. They’re both frightened and restless. Bury me, my Love is a reality-inspired interactive fiction designed for mobile phones. We imagined its core mechanics with two main references in mind: WhatsApp and Lifeline. You will also be asked to make important choices – as you are required to do in the Lifeline series and other interactive stories. Nour will regularly seek help and ask for your advice. The happy unfolding of her journey is in your hands. She won’t systematically do as you say though, and sometimes she might also hide things from you. You’ll have to deal with that, as she is the one risking her life. Communications will occur in pseudo real-time. If Nour is supposed to do something that will take her a couple hours, there will be no way for you to reach her during that time lapse. Once she is back online, you receive a notification that she’s available – and perhaps needs you. How will you best help? Contrary to lots of other interactive fictions, your choices in Bury me, my Love really have an impact on the story. This is, for us, a very efficient way to render the complex situations migrants are in, and the weigh their choices often have. Our three core mechanics aim at reflecting this reality. The voyage from Syria to Europe does not have a predefined length. It might be done in a few days only, but also take months, sometimes years. The app will make sure to keep track of time, and signal every new day, as if it were the beginning of a new chapter. Nour leaves Homs with an ideal itinerary on her mind, but things quickly become complicated. Soon after her departure, she begins to hear lots of rumors on the ground – hearsay that is often contradictory. She is going to have to improvise, and seek possible ways to continue her trip once she reaches a destination. Should you advise her to do so, Nour might eavesdrop for precious knowledge: new means of transportation, places where, according to rumors, a trustworthy smuggler might be found… Reacting to Nour’s reports, Majd will then automatically post maps of new possible destinations in the discussion thread, thus allowing the couple to make the best next decision available. In Arabic, “Bury me, my Love” is an expression that means “Take care”, “Don’t even think about dying before I do”. You might say it to a loved one, before going separate ways. They are the last words Dana’s mother told her to wish her good luck, as the young Syrian girl left her country. It was on September the 19th, 2015, when Dana had decided she would reach Germany at any cost. Bury me, my Love does not tell the story of Dana’s travels. Thanks to Lucie Soullier, a journalist at lemonde. fr, and to her article, “Le Voyage d’une migrante Syrienne à travers son fil WhatsApp” (“The Journey of a Syrian Migrant, as Told by her WhatsApp Messages”), we know Dana’s story. But even though both women are part of our editorial team, Bury me, my Love isn’t biographical. Our two main characters, Nour and Majd, are fictional. They do not exist, or rather, they exist collectively. They are a multitude of men, women and children: Dana, her mother, her brother-in-law… as well as thousands of others who flee their country – or watch their relatives flee – all in hopes of finding a better life in Europe. This story is about those who achieve that goal. It is about those who don’t. It is about those who die trying. It is about the world around us. Something which we hope will lead you to keep pondering on after it is over.